Luke 6:42 How can you say to your brother, 'Brother, let me take the speck out of your eye,' when you yourself fail to see the plank in your own eye? You hypocrite, first take the plank out of your eye, and then you will see clearly to remove the speck from your brother's eye. It can be a challenge to avoid judgement of another. It takes practice to do the opposite. When you hear someone critical of another, you do have to ask the one passing judgement the question "how is it he or she is___?" and you are not? We are far from being perfect. Sometimes it takes a good listening ear to hear what is truly going on in another. You never know. 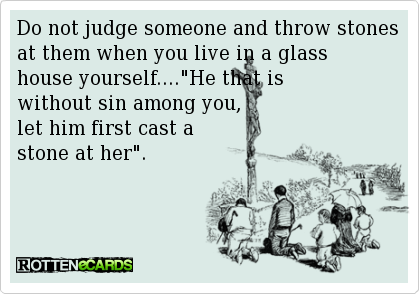 Refrain from judgement scripture says because you are also being judged.